Jerusalem, Feb. 15, 2016...In an address to the more than 100 Conference of Presidents of Major American Jewish Organizations delegates on the second day of its 42nd consecutive annual Leadership Mission to Israel, Defense Minister Moshe Yaalon said that Israel will not intervene in the Syrian civil war, though Israel is supplying humanitarian support. 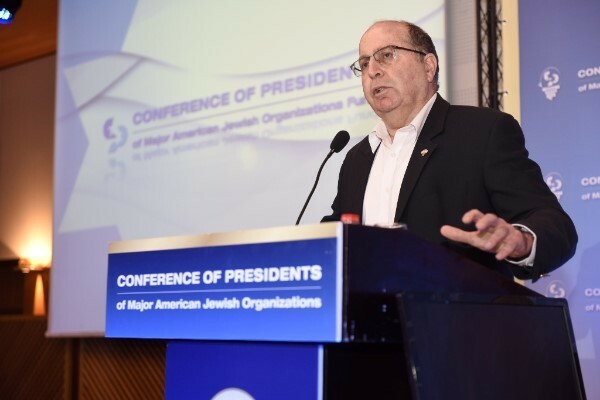 “Syria will leave us with two bad options: we will have either Daesh or Iran on our border,” Minister Yaalon declared that Israel will not tolerate the delivery of chemical agents to any combatants, nor will Israel tolerate disturbances on its borders. He told the audience that in the last two years there have been 20 attacks on Israel’s borders by Iran and its proxies, which is why Israel strongly rejects the current political process led by Russia. Turning to the Israeli-Palestinian conflict, Yaalon detailed the incitement and manipulation that emanates from the Palestinian Authority. He said they continue to educate their children that Tel Aviv has been occupied since 1948, and it is Abbas who rejects the two- state solution and denies that Israel is a Jewish state for the Jewish people. Yaalon was one of three high-ranking Israeli government officials to address the delegation today. Gilad Erdan, who is simultaneously Israel’s Minister of Public Security, Minister of Strategic Affairs and Minister of Information, and Yesh Atid Chairman Yair Lapid were the other two. Minister Erdan focused on the fight against BDS. “Both BDS and what some are calling ‘lone wolf’ attacks stem from the same foundation: the de-legitimization of Israel and the denial of the Jewish people to have a state,” he said. Demanding that social media take responsibility for their part in allowing people to use them for terror, he explained that the technological capability and basic willingness on the part of Facebook and Twitter is there, but it is taking time for them to understand how severe the situation is. Extensive, wide ranging expert panels and discussions on Iran post-JCPOA, the Mideast Regional situation and dynamics, anti-Semitism and BDS, and Israel’s social fabric were also conducted throughout the day.